I will be instructing an online course that can be useful to those working in organizations who receive or send goods to/from multiple sources (the hospital, large shops, Bhutan Agro, UNDP, printers, Yogurt production plant, traditional medicine, BioBhutan, and more). Does your organization receive or send goods to/from multiple suppliers? How do you assure that the quality is up to standards? Sampling plans are used in industry world-wide as a means of assisting quality assurance personnel to decide whether to accept or reject batches of goods or services. Many organizations require the use of ISO standards for assuring the quality of incoming (or outgoing) batches of goods. This course introduces acceptance sampling plans according to ISO and other popular standards and the statistical logic underlying such plans. This is a hands-on course with a focus on practical aspects of acceptance sampling. The course starts on April 15 and takes place online over 4 weeks. The course is fully asynchronous, so there is no specific time that you must be online. Each week includes materials to view online and offline (including videos, interactive applets, and more), and a hands-on assignment that you can complete at your own pace and receive feedback. Participants can post questions and have discussions with the instructor on an online discussion board. The course will require around 10 hours per week. You can find more details here. This is a great opportunity to interact with other participants world-wide, and to take advantage of online learning. You can also obtain a "certificate of course completion". Pre-requisite: Participants should have basic knowledge of statistics and probability. In particular, they should be familiar with the concept of random variables, the Normal and Binomial probability distributions, and statistics such as the sample mean and standard deviation. These topics are covered in basic statistics courses at most universities or colleges. About the Instructor: Galit Shmueli is a Professor of Statistics at the University of Maryland's Smith School of Business. She is currently in Bhutan with the Rigsum Institute of IT & Management. 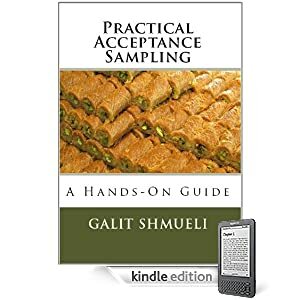 Prof Shmueli authors the book Practical Acceptance Sampling. Registration: While the course costs $499, I have negotiated a special rate for Bhutanese participants which can be paid in Nu. and also includes helping you get the course text. Please contact me if you'd like more information or to register.